In forex fundamental analysis, we measure the performance of an economy to determine the potential price movement of a currency in terms of other currency or currencies. 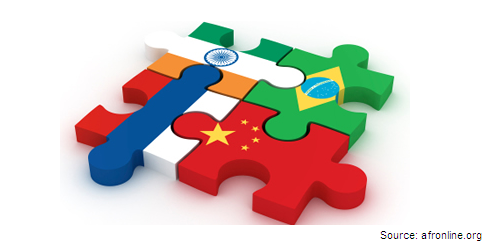 International trade partners' economies play significant role in the fundamental analysis of a currency. In a trading day, I was waiting with a long order on AUD/USD, and suddenly the pair was gone up at about 100 pips. I was completely surprised, and started searching to find out the reason behind that. I found the Chinese Manufacturing PMI was released that time, and the data was better than expected. This post is written to explain how the trade partners' economies can affect the value of a currency, and how an analysis on the trade partners' economies can be conducted. Look at the following points, which shortly explain how the trade partners' currencies can affect the domestic currency. If the currencies of the import partners get stronger, the currency of the domestic nation get weaker. This is because to import the domestic nation will need more currency to buy the imported products from the import destinations. If the currencies of the import partners get weaker, the currency of the domestic nation get stronger. Here the imported products will be cheap to the domestic country. If the currencies of the export partners get weaker, the price of the exported products will go up, as a result the demand for the exported product may go down. If the currencies of the export partners get stronger, the price of the exported products will go down, as a result, the demand for the exported product may go up. These are some of the situations, where the domestic currency is affected by the international trade partners' currencies. But the practical situations are not that easy to understand for the forex traders. Conducting a study on the trade partners' economies is just a single dimension of the fundamental analysis, but it requires huge study. A complete fundamental analysis on the trade partners' currencies is needed. 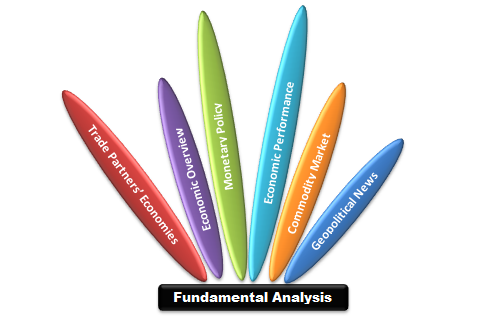 So, to conduct the fundamental analysis traders need to go through the following dimensions of fundamental analysis for the every individual currencies of trade partners. To conduct a study on the trade partners' currencies or economies, firstly, traders have to know "Who are the closest friends of the country". I will suggest a study on the top five trade partners. The monetary policy of a trade partner's economy creates a long term sentiment towards the value of a trade partner's currency. The monetary policies of the trade partners' economies should be tracked by the forex traders. Similarly, study on the all other dimensions of the fundamental analysis illustrated in the above image should be conducted for the currencies of trade partners. If a geopolitical news significantly affect the currency or economy of any of the trade partners of a country, the currency value of that country can be affected. Besides, if any of the trade partners' economies is affected by the price of a commodity, the domestic country can be affected by the price of that commodity. The economic performance of the trade partners' may determine the demand for the exported products or price of the imported products. If you have already read the post "How to conduct forex fundamental analysis", then you should already know about the dimensions of forex fundamental analysis illustrated in above image. Fundamental Analysis of a trade partner's economy is important because of the importance of trade partner's currency value in the international trade of a country. In the aforementioned passages, we come to know, how the domestic currency and international business can be affected by the trade partners' currencies. If any major economic decision of a trade partner's economy increases or decreases the demand of the exported product or price of the imported product, the currency value of the domestic country can be affected. This month the People's Bank of China decided to go for Quantitative Easing, as a result, the Australian Dollar became stronger. This is because this decision would boost the Chinese economy and demand for the commodities exported by Australia, though the decrease in CNY value would make the Australian commodities little costly than before. Dear Traders, In trading days ,you surely will face the situations mentioned above. A complete fundamental analysis of a currency cannot be conducted avoiding the trade partners. If you want to join the discussion, you can drop a comment below, and to receive the updates,you can subscribe yourFXguide, using the email subscription box.